Are you wondering what to do with all of your Thanksgiving leftovers? Well, you could freeze them, but if you still have a house full of company and a plate full of leftover turkey, check out this delicious and easy leftover turkey enchiladas recipe. Sure, I know it’s as much of a tradition to make turkey soup or turkey sandwiches with your turkey leftovers, as it is to eat turkey on Thanksgiving. But, to heck with tradition! Why not try something new this year, a surprising twist on a Cinco D’Mayo favorite? I can promise you, and your family will be thrilled. Oh, and did I mention that this recipe serves eight? So if you are not feeding that many people, you can either just half the recipe, or do what I do and make the full recipe, but use two pans, and serve one and freeze one to serve later. 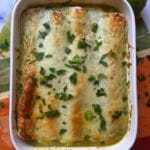 And, if you have leftovers, Easy Turkey Honey Lime Enchiladas are also delicious reheated the next day. How about that? Leftovers making leftovers; it’s a recycling Thanksgiving miracle! 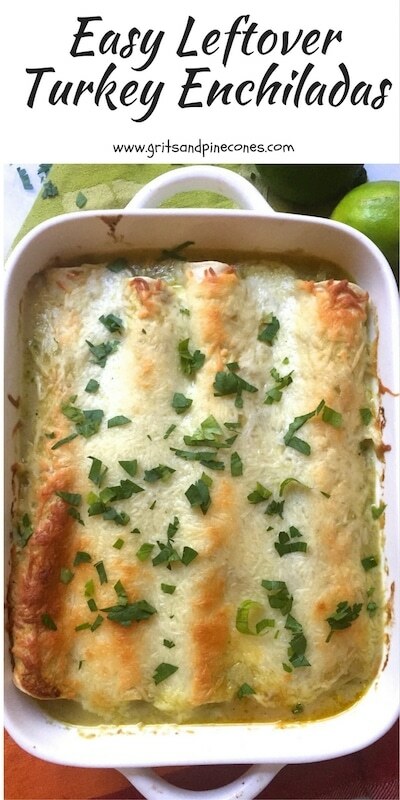 Now back to the easy leftover turkey enchiladas recipe with lime and honey. 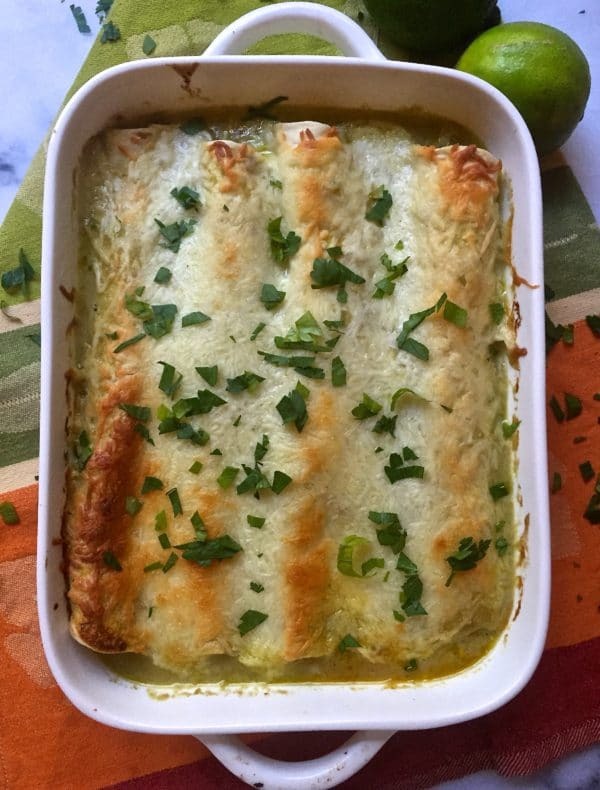 This recipe, which is somewhat different from traditional chicken enchiladas, features shredded turkey marinated in honey and lime juice. All of this deliciousness is then wrapped up in a tortilla along with some cheese and topped with an out-of-this-world salsa verde sauce, Crema which is Mexican style cream and yes, even more, cheese. Take my word for it; this dish is really, really, really good! It’s one of my husband’s favorites! Ok, if you’re ready to get started, then gather your ingredients and let’s get cooking! 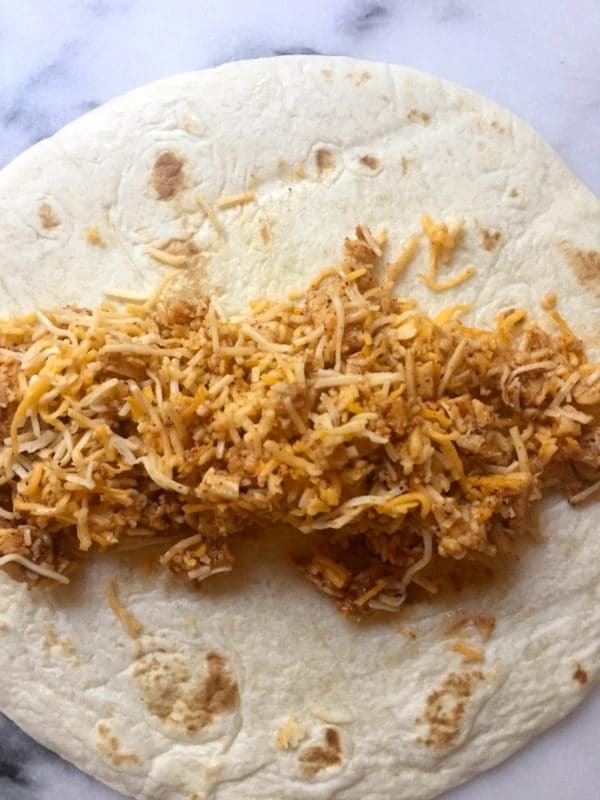 The ingredients you will need are honey, lime juice, chili powder, garlic powder, turkey, flour tortillas, Monterey jack cheese or a Mexican blend, green enchilada sauce, salsa verde, and Crema or you can use heavy cream. I know it sounds like a long list, but it comes together quickly. The leftover turkey does need to marinate for a minimum of 30 minutes but can marinate for up to 24 hours so plan accordingly. 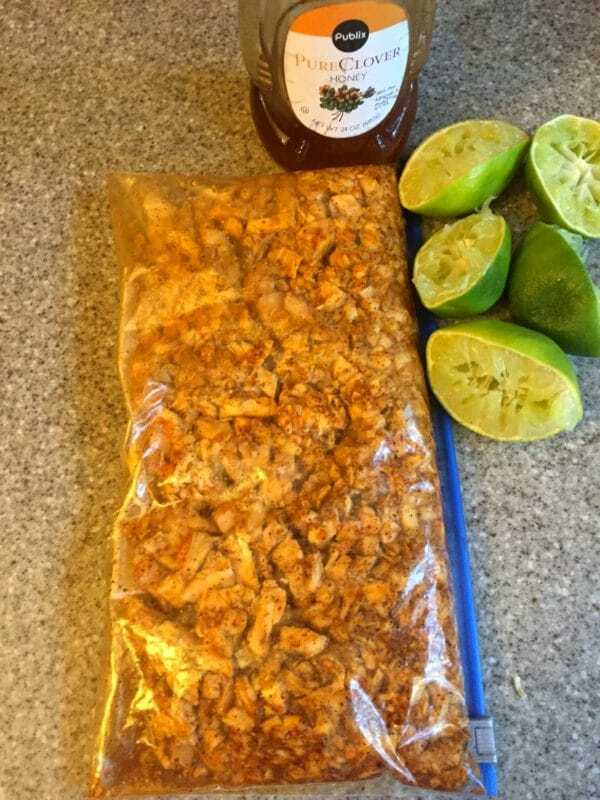 If you are ready to get started, gather your ingredients and mix the honey, lime juice, chili powder, and garlic powder. Place your turkey in a plastic storage bag and pour in the marinade making sure all of the turkey pieces are saturated. Let the turkey marinate in the refrigerator for a minimum of 30 minutes or up to 24 hours. The longer the turkey marinates, the better. When you are ready to cook, preheat your oven to 350 degrees F.
Spray a 9×13 baking dish with a non-stick cooking spray to make cleanup later a snap. Pour 1/2 cup of the green enchilada sauce into the bottom of the dish and spread out. Drain the turkey mixture and reserve any remaining marinade. 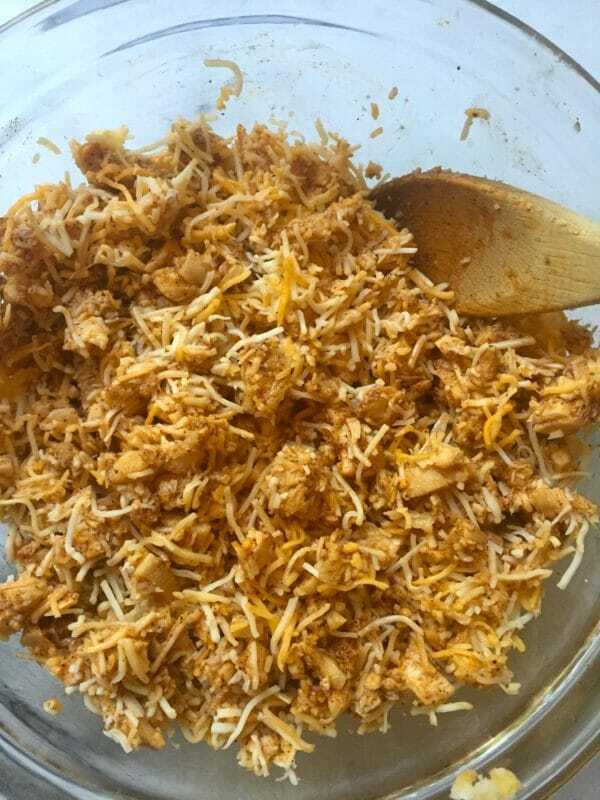 Mix the turkey with 3 cups of the shredded cheese. Put a heaping 1/2-cup of the turkey mixture down the center of each tortilla and roll up as tightly as you can. Mix the other half of the green enchilada sauce with the salsa verde, Crema, and any leftover marinade. Pour this mixture over the enchiladas and top with 1 cup shredded cheese. 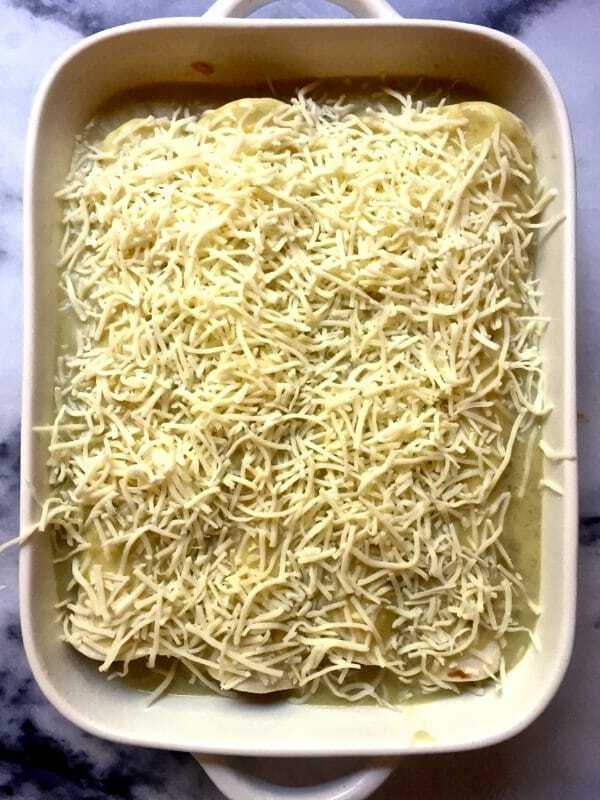 Bake at 350 degrees for 35-40 minutes, or until the mixture is bubbling and the cheese has melted. Let sit for about 5 minutes and serve. Enjoy! Are you wondering what to do with all of your Thanksgiving leftovers? Why not try this easy leftover turkey enchiladas recipe and enjoy the after holiday snack? To begin, mix the honey, lime juice, chili powder, and garlic powder. Place your turkey in a plastic storage bag and pour in the marinade making sure all of the turkey pieces are saturated. Let the turkey marinate in the refrigerator for a minimum of 30 minutes or up to 24 hours. The longer the turkey marinates, the better. Spray a 9x13 baking dish with a non-stick cooking spray to make cleanup later a snap. Pour 1/2 cup of the green enchilada sauce into the bottom of the dish and spread out. Put a heaping 1/2-cup of the turkey mixture down the center of each tortilla and roll up as tightly as you can. 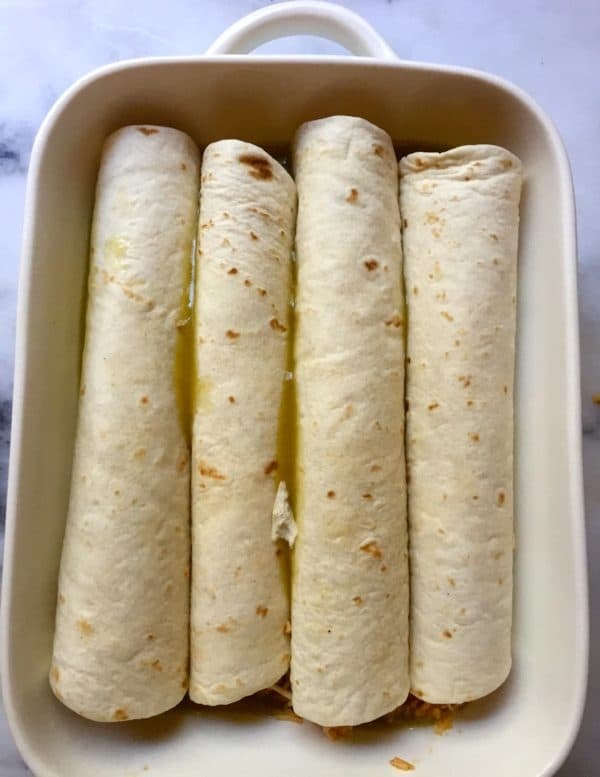 Place the rolled tortillas in your baking dish seam side down. Repeat for the rest of the tortillas. You should be able to fit 8 enchiladas in the dish. YUM! These looks so delicious and easy!